Just came back from London, where I spent two days (19-20 October) tasting nearly 80 cru bourgeois from the celebrated 2009 vintage. 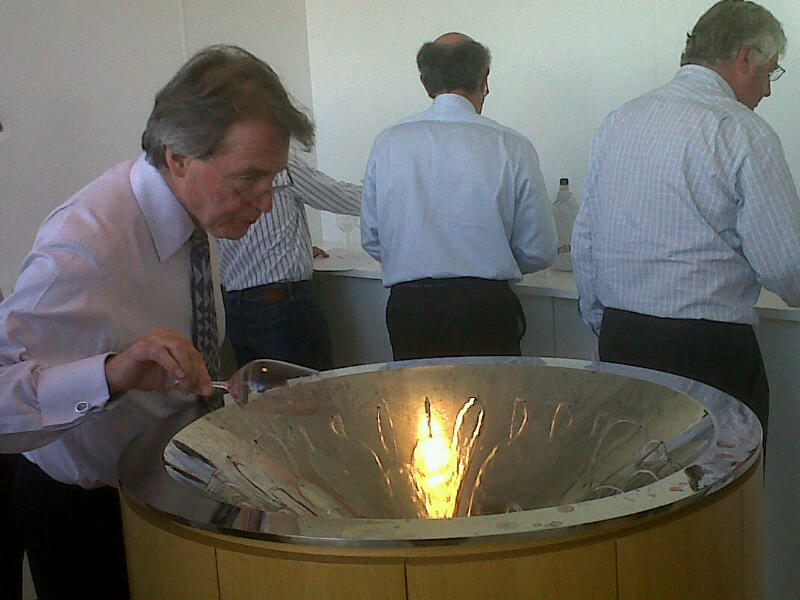 It was a blind tasting for Decanter magazine, in the company of some far more experienced palates, including Stephen Spurrier, Stephen Brook, Hugo Rose MW, and others. It was my third time in less than two years, judging with a Decanter tasting panel. For readers with suspicions about an ad-based magazine being biased in any way about such tastings, let me put those suspicions firmly to rest. Once again, this was a very professional tasting. All blind. Last year, when I did a similar blind tasting of 2008 grand cru St Emilion, the results were published as we had experiened. We were provided with clear white tasting sheets with enough room for a maximum of six wines: enough space to describe each wine tasted and provide a score on a 20-point scale, and estimate drinking windows. The wines, disguised by white covers (see photo), were divided according to appellation: Medoc, Haut Medoc, Margaux, Moulis, Listrac, Pauillac, St Estephe and so on. The white covers with Decanter logos were marked with a red number. Each panelist tasted about 80 wines, not all the same wines because there were some 200+ cru bourgeois to taste in two days. But at least three or four panelists tasted the same wines so that it would be a group result. The tasting manager then calculated average scores. Any notes taken would be used for the future article. At the end of the second and final day of tasting, he gathered bottles that were controversial and then labeled them with letters. 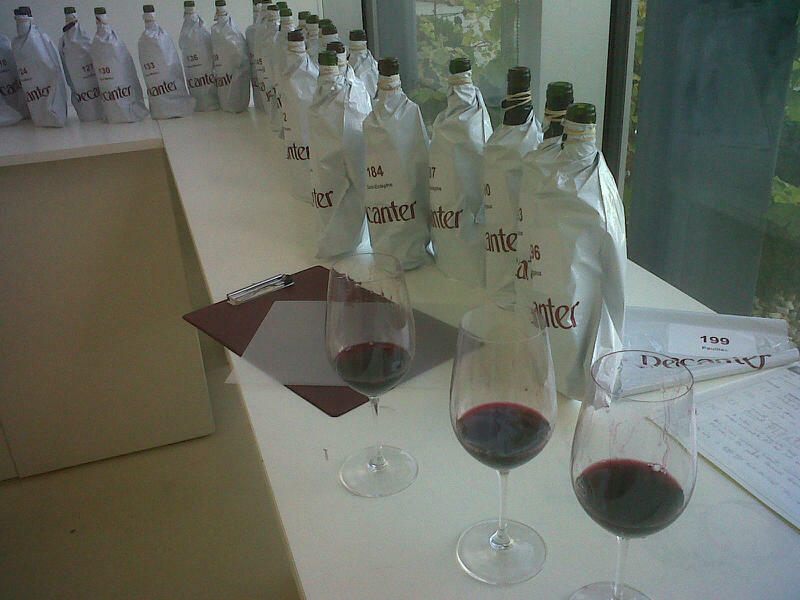 I think there were about 12 “controversial” wines (wines which had obtained very varied scores among the judges). Wines will be published which obtain gold, silver and bronze medals. In smaller print, “recommended” wines (wines which barely obtained passing notes). Quite a few medal winners in 2009, but I cannot reveal how many from each category! The results were somewhat surprising. Again, I cannot spoil Decanter’s future article with scooped details – and I would probably not be asked back if I were to do so. But I can say that, for the most part, one would be safe to purchase Haut Medoc 2009. 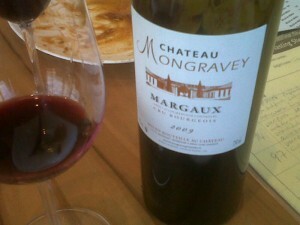 It is more patchy with Medoc 2009. There were some disagreements over Listrac. I only tried two Listracs, and both were not very good… Many panelists were not pleased with Moulis, but I found two that were quite nice. Almost all of us agreed that St Estephe shined brightly in 2009. So no surprise there. Margaux was a mixed bag. I did not taste any Pauillacs. Some wines were a bit over oaked and modern, even with jammy notes and/or overripe. A few I tasted were green grasshoppers, too, perhaps victims of some heat stress that blocked maturity. 2009 was no 2003, but it was a hot vintage, as opposed to, say, 2008. Most panelists had rather high average scores, however, in the mid to upper 15-point range. We also talked about the cru bourgeois brand – or lack thereof? Back in 2003, there were a handful of top cru bourgeois that toured the world, and served as a distinct motor for the cru bourgeois label. But disputes over that classification and its subsequent annulment lead to a far more vague notion of cru bourgeois… In any case, the market has recognized top wines. Such as Phelan Segur and Haut Marbuzet in St Estephe. Or Pibran in Pauillac. Or Poujeaux and Chasse Spleen in Moulis. Or, for that matter, Sociando Mallet in the Haut Medoc appellation – a wine which did not even take part in any of the official classifications. Everyone who knows Bordeaux recognizes Sociando Mallet’s quality. 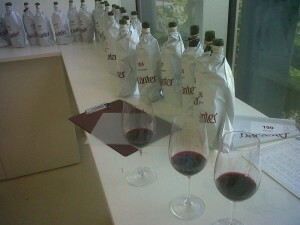 That is all I can say about this tasting for now, because I do not want to spoil the results. I will ask Decanter Magazine when they plan to publish and ask you to be sure to get that issue! Hey! Do you use Twitter? I’d like to follow you if that would be ok. I’m certainly enjoying your weblog and appear forward to new updates. Thanks for reading. I was using Twitter until my account was either hacked or hit by a virus, but I will likely reactivate the account which is simply my name PanosKakaviatos.